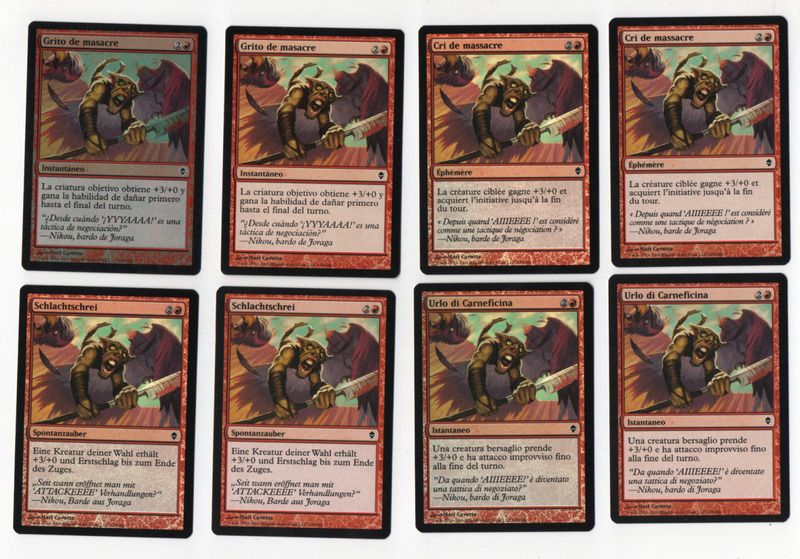 I'm not collecting misprints to make money, but there's always the option to "cash out" (which can be true for any type of collection) which helps justify the money I put into it. If one day my collection were to severely drop in price, I'd be pretty bummed out. I collect because I love collecting. When I wrote that post, I had several bids out on both eBay and the facebook group, so I guess I don't plan on stopping any time soon. Maybe I just need to take a break from playing maigc. Anyways in the event that I do end up needing to sell part or all of my collection in the future, I'll let you guys know first. Trying out a new way to protect/store/display my collection. Not nearly as spacially effective as a binder, but more presentable than a top loader. 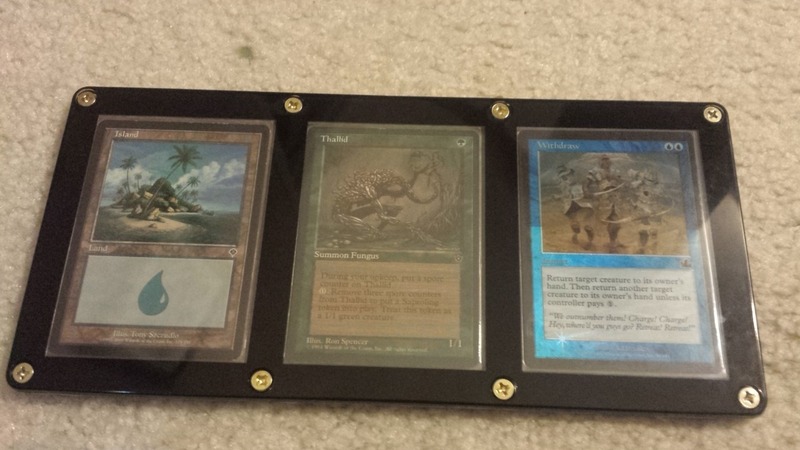 My misprint binder is also one of those Monster brand binders, and I never really liked that you couldn't see the card backs (but did like it much more than a 3 ring binder). I also got one that holds 6 cards. Don’t buy it. There are no screws in the center so the cards are loose in it. How do you guys store your cards? Do you like these cases? I would recommend the Decktutor (2.0) Binder. Put each card in a perfect fit sleeve and your ready to go. I put my signed sets in those. 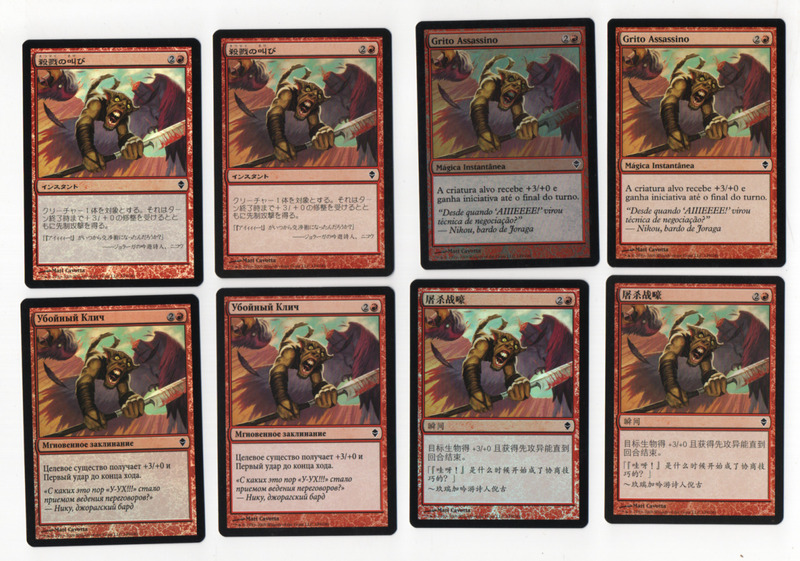 It only took 5 years to find 42 cards but I have finally completed my global set of slaughter crys! Behold! This silly little collection wouldn't have been possible to assemble without the help of fellow librarities member and friend Neuron. Than you for your help! What's next? Maybe another +3/+0 and first strike giving instant with a goblin in the art? Neuron has been a HUGE help to my global pursuits also. [quote="TheJGit"]Trying out a new way to protect/store/display my collection. 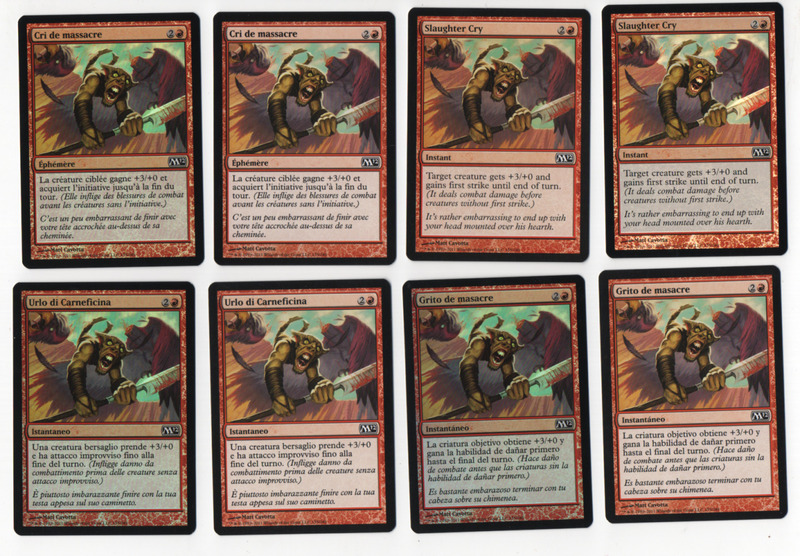 Not nearly as spacially effective as a binder, but more presentable than a top loader. 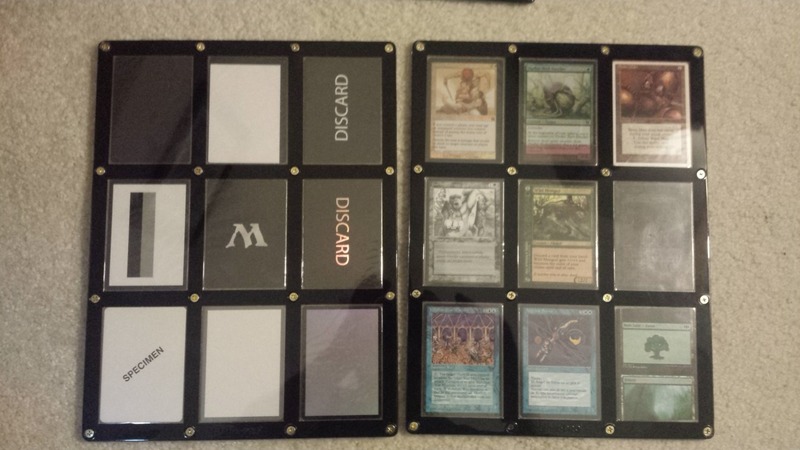 My misprint binder is also one of those Monster brand binders, and I never really liked that you couldn't see the card backs (but did like it much more than a 3 ring binder). I also got one that holds 6 cards. Don’t buy it. There are no screws in the center so the cards are loose in it. How do you guys store your cards? Do you like these cases? I like that page you have. Years ago I bought one but it had screws only on the edges (9 card page) and of course, like your 6 card one they kept slipping around, really up set me too. so it went in the junk pile. Where did you get these and what did they cost. 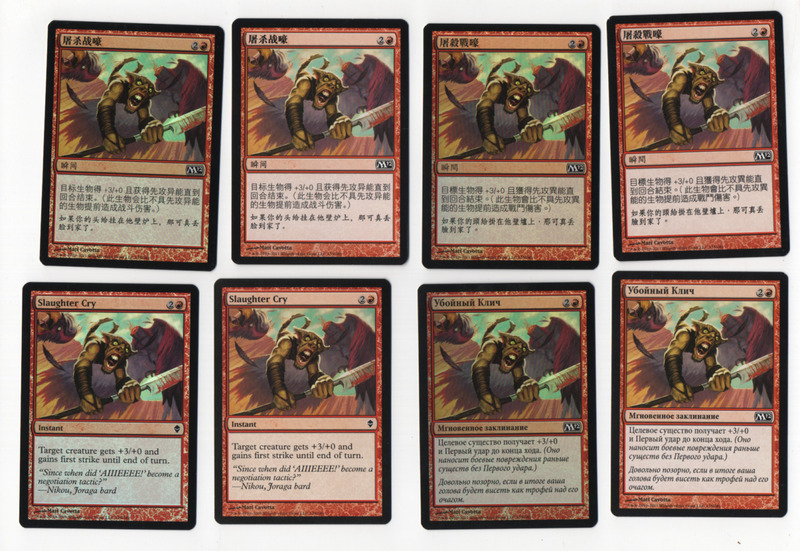 I'm not interested in whole sets like this but there are special cards I would like to be able to view (actually thinking about the power 9 from each of A-B-U, side by side). mystical_tutor wrote: I like that page you have. Years ago I bought one but it had screws only on the edges (9 card page) and of course, like your 6 card one they kept slipping around, really up set me too. so it went in the junk pile. It's much easier to organize new additions when I can insert pages wherever I want. I have always used the 3-ring binders even though I live in fear of the famous "binder crease" The biggest reason is as you mentioned of the freedom to change things around. (like getting more Artist Proofs and wanting to arrange them alphabetical or some such thing. To defend against the binder crease I have used the wrapper for the Fat Packs and the bocklet that comes in them. Those just go in front of the set and it seems to keep everything safe. I'll check out Amazon and see what they have, thanks. Happy to see this collection complete! In case you are very much into it, there are both front cut USA and back cut Belgium print runs of English Zendikar and M12. Well it certainly has been a long time since I've contributed anything significant to these forums. Sorry!!! I blame Facebook. . Anyways I recently decided to scan every page of my binder, and put it up on the internets for people's viewing pleasure. I've gotta share it here too of course! Here's a link to the site: https://www.misprintedmtg.com/the-digit ... er-project and a couple of select pages for you to enjoy! I enjoy the digital binder project. It was truly amazing to see your binder in person though. Thank you! I look back at this thread and cant believe how close I was to quitting the hobby. I guess I've done a complete 180 since. Love is love! Thanks! I need to find a good way to update it though because I tend to reorganize my binder every 3-6 months or so. Guess I'll just have to scan it all over again! You binder was incredible to see in person as well! I feel like I didn't spend nearly enough time with it since I was fiddling around with the streaming stuff! I guess we'll just have to fix that the next time we meet! Also when you said, "Hey guys, wanna see something neat?" was one of my favorite parts of misprint con! Just too cool. Definitely amazing! 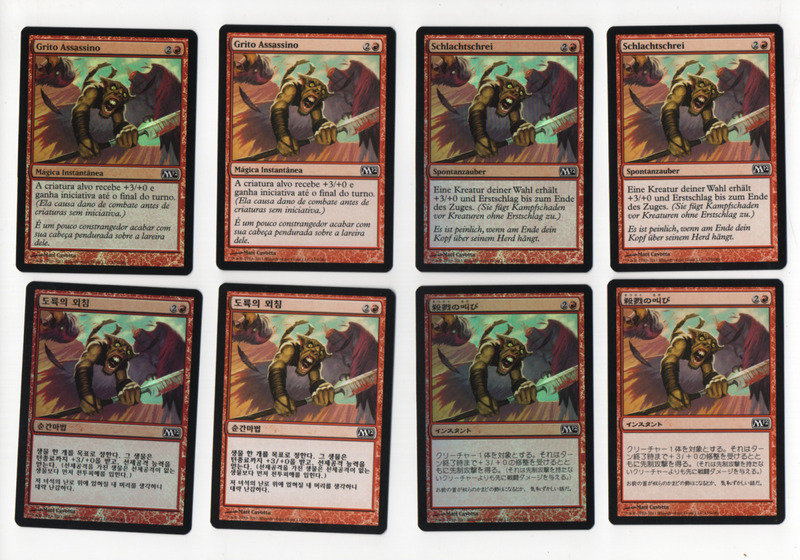 My favourites are the miscut Alpha cut 4th and the miscut Discard filler. Remove the "garbage" at the end, though, unless you want to become misprintedccg.